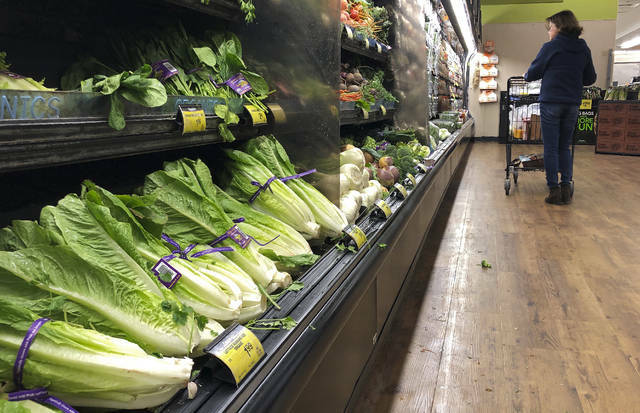 Romaine Lettuce still sits on the shelves as a shopper walks through the produce area of an Albertsons market Tuesday in Simi Valley, Calif. Health officials in the U.S. and Canada told people Tuesday to stop eating romaine lettuce because of a new E. coli outbreak. NEW YORK — Avoid all romaine lettuce, but don’t worry about your turkey. With two food poisoning outbreaks making headlines before Thanksgiving, the messages about what’s safe to eat can be hard to keep straight. Here’s what you should know before you sit down for dinner. On Tuesday, U.S. health officials issued an unusually broad warning against all types of romaine lettuce amid an E. coli outbreak. They asked restaurants and grocers to stop selling it, people to stop eating it and everyone to throw it all out. Thirty-two illnesses in 11 states have been linked to romaine. Canada also was affected, with 18 illnesses in Ontario and Quebec. No deaths have been reported. Wasn’t there already a romaine outbreak this year? Yes. The strain of E. coli in the current outbreak differs from the one linked to romaine earlier this year that sickened about 200 people and killed five. But it appears similar to the strain identified in a 2017 outbreak that happened around the same time of year. That outbreak was linked to “leafy greens,” but a specific supplier or vegetable was never identified in the U.S. This time, officials were able to issue an alert earlier and specifically warn against romaine because of information collected through interviews with people who got sick, said Laura Gieraltowski, of the Centers for Disease Control and Prevention. Are vegetables causing more food poisoning? Improved detection may be driving up the number of outbreaks tied to produce. But the way food is produced is another consideration. Timothy Lytton, a professor of law at Georgia State University, noted that large cattle feeding lots could be a contributing factor. What do cows have to do with e. coli getting into lettuce? Huge numbers of cows produce large quantities of animal waste. And bacteria from cattle feces can migrate into the water used to irrigate produce fields, Lytton said. In fact, tainted irrigation water was identified as a likely source of this year’s previous E. coli outbreak linked to romaine from the Yuma, Arizona, region. After the Yuma outbreak, growers in California and Arizona increased the buffer zones between animal lots and produce fields, from 400 feet to 1,200 feet. Teressa Lopez, an administrator with the Arizona Leafy Green Marketing Agreement, also noted that growers in the state started treating water that runs near animal lots. The treatment, which kills pathogens, is used on water that is going to be used on produce. The Food and Drug Administration has new rules to step up the safety of produce, but the implementation is staggered and began just recently. The agency has said inspections won’t start until next year. Sarah Sorscher of the Center for Science in the Public Interest noted the importance of measures such as testing irrigation water. But a water-testing requirement has been contested and postponed, given the limited availability of tests that can specifically detect the harmful types of E. coli. Ultimately, that rule may not be implemented, Sorscher said. Why can’t i just wash my romaine? Washing doesn’t kill germs like the heat from cooking does. That’s why health officials are warning against all romaine. According to a 2013 U.S. government report , leafy greens such as lettuce and spinach are the biggest source of food poisoning. “Any product that we don’t have a cooking step is a bigger issue,” said Martin Wiedmann, a professor of food safety at Cornell. When can i have salad again? It’s not clear when it will be OK to eat romaine again. Public health officials would want to be able to identify the source of the contamination or see the reported illnesses stop. Romaine has a shelf life of 21 days. Romaine sold in the U.S. comes from different regions at different times of year. So while the romaine lettuce linked to the E. coli outbreak earlier this year was from Arizona, romaine lettuce on shelves now is mostly from California, regulators said. Harvesting just recently began shifting back to southern California and Arizona, though most of that product has not started shipping, according to Lopez of the Arizona Leafy Green Marketing Agreement. She said suppliers were asked to withdraw products until health officials are confident the pipeline is clear of contaminated romaine. Besides the romaine outbreak, there’s a long-running widespread salmonella outbreak linked to raw turkey in the U.S. Raw meat and poultry is allowed to have salmonella because it’s assumed that people will cook it. That’s why regulators aren’t telling people to avoid it, they’re just reminding people to properly handle and cook their holiday birds.